My source at ALICE has sent me the above photo, taken at the end of 2006 when the magnet had a bit more in it. Two Birmingham students (Hannah Snow and Daniel Tapia Takaki) help to show the scale. The photo is the copyright of the STFC but free for non-commercial use. He also points out that the ALICE experiment will run irrespective of the problems in the UK, albeit with considerable difficulty initially if the UK participation is withdrawn since our scientists are responsible for a crucial element. Thus the STFC mishandling is a local tragedy - but a major one for those who have spent fifteen years of work and investment in the project. They may only be able to find out about what ALICE has achieved by reading about it second-hand. However, the problems with funding for ALICE are part of a bigger picture where there is a series of cutbacks in basic (i.e. 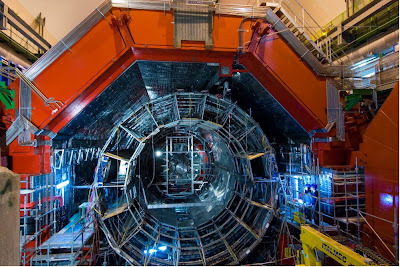 not "applied") physics projects, covering the "big science" areas of particle physics, nuclear physics and astronomy. If you want to find out more about these experiments, there is a film at Research TV. I couldn't get the film to run but here is a link to the transcript. The Science Museum's Big Bang section has some easily digestible explanatory material on these experiments.